Imagine a site that combines Flickr, DeviantART, and Mixi. That's what PIXIV is. It's run by a company called CROOC in Japan, and is becoming one of the places that I visit on a daily basis. I'm not sure that I can capture in words the sheer awesomeness of the website, but I'll do my best. 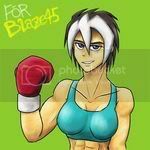 Many of the Japanese artists that enjoy the muscular female form are already members, and I'll list some at the end of this entry. 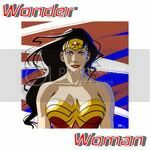 I've also discovered quite a few new artists through the site and I'll feature some of these artists in future posts. My purpose today is to help people get started using PIXIV. I've discovered there's an account out there that can be used for logging in if you don't want to create your own personal account. Use saradas as the username and password, and you should be able to get in to take a look around. 1. Go to PIXIV and click the button that reads 新規登録 Sign up for pixiv. 2. Type in your mail address and hit the button below the field. Hotmail isn't allowed. Gmail/Yahoo are ok, but check your Spam folder for the confirmation e-mail. 3. 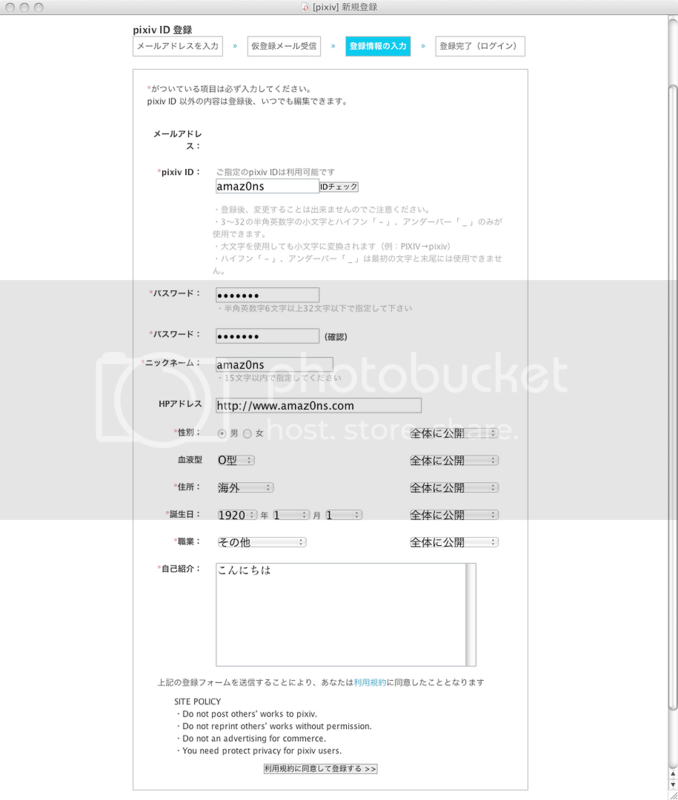 This next page tells you to check your e-mail for the confirmation message. Remember to check your Spam folder. I used Gmail and it went into my regular folder and came pretty quickly. Click on the link in the confirmation message to proceed to the next step. 4. This next page has a few fields that you'll need to fill out. 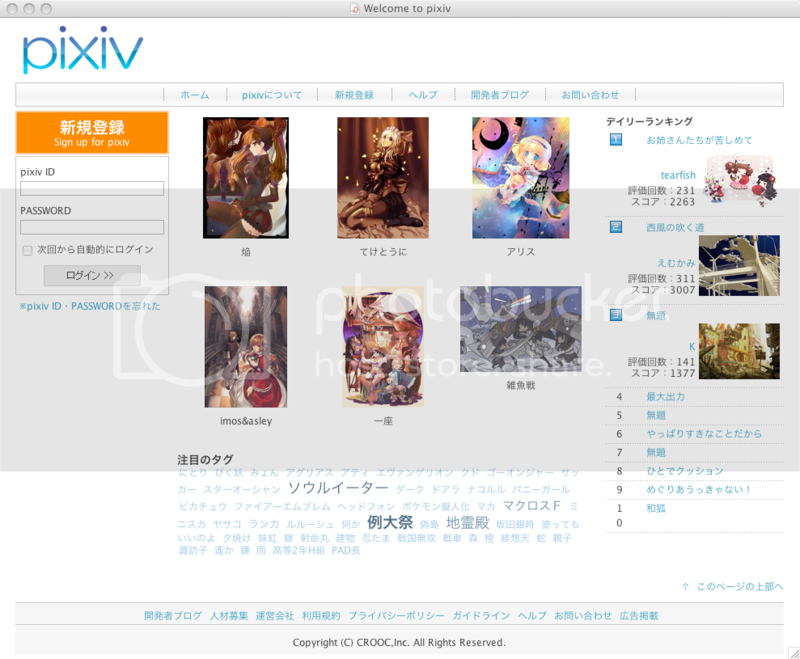 The first field is your pixiv ID, click the button next to the field after typing something in order to check if it's available. The next 2 fields are for you to type in a password. The fourth field is for a nickname, and the 5th field is for a website. The next 5 fields (Male/Female, Blood Type, Location, Birth Date, Occupation) have a drop down box next to them which set the view levels for the profile items. The default option is public, the next is for friends-only, and the last option is for private. For the 5 fields, just pick the first option below the default if you want to proceed quickly. Fill out something in the last box as an introduction, then click the button on the bottom. Also take note of the Site Policy in English at the bottom of this page. 5. Congratulations, now you should be logged in with your very own Pixiv account. 6. Optionally Change your settings ( 設定変更 ) so that you can see all the art on PIXIV. Skip this step if you want to keep things worksafe. Look for the row that says R-18, and toggle the radio button to the other option. This will un-hide a R-18G ( Grotesque ) option which you can also toggle if you choose. Hit the button on the bottom of the page to save your settings. Click on a name, and you'll get taken to a member's profile page. Click on a thumbnail, and you'll go to a picture page. Click on the picture page to get the full sized version of the picture. Every member is identified with an ID number, and every picture also has a different ID number. Hopefully, this information will give be enough for you to navigate the site. 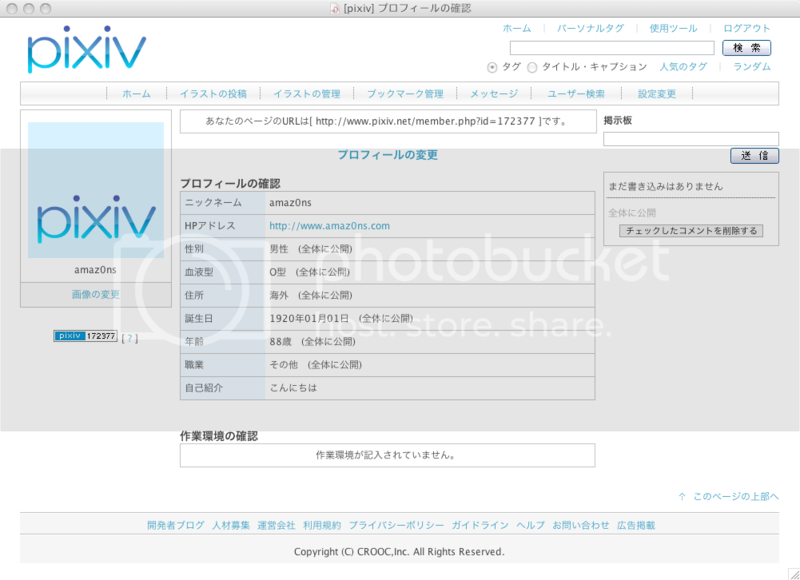 Tagging is one of the hallmarks of sites like Flickr, and Pixiv gets it right. Just type in the Kana or Kanji of what you're interested in and highly relevant pictures will be returned to you. 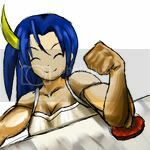 The tag that will be of most interest to us is 筋肉娘 ( Muscle Girl ), but here are some related tags that you'll find browse-worthy: ムキムキ, 筋肉女 ( muscle female ), 筋肉 ( muscle ), おっぱい ( breasts ), GTS ( giantess ), 大女 ( big female ), 巨娘 ( enormous girl ), 腹筋 ( Abs ), プロレス ( Pro-wrestling ). Happy hunting. You can bookmark users or images. The 'bookmark user' link appears in the main bar as mentioned before: お気に入りに追加 ( Bookmark User ). The 'bookmark image' link appears above images on the right-hand site and is labeled このイラストをブックマークする. Bookmarked images and users can be accessed through your main profile page. It's important to build a good list of bookmarked users, because new images from those people will appear on your main page. It's a great way to keep up with your favorite artists. The concept of My Pick ( マイピク ) is similar to Mixi's My Miku ( マイミク ). It's really only supposed to be used for friends that you know personally. Adding someone this way requires an approval from the other person, and connects you both. So you'll appear in their My Pick list and they'll appear in yours. I don't recommend using this feature that often with people that you don't know. Bookmarking users gives you the same functionality, and doesn't require an approval so bookmark as much as you want. 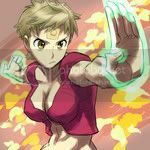 As I mentioned earlier, several artists already have accounts on PIXIV, so you're sure to come across some familiar artwork. 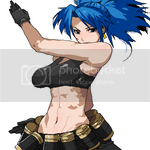 You definitely should bookmark Dairoku Tenmaou, B.L-san, and REN who are the respective artists of the images above. 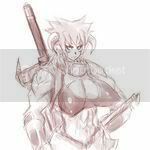 Click on the thumbnail for the link to the PIXIV image page, but be warned that you'll need to be logged in to view them. There's material there that you probably haven't seen before. 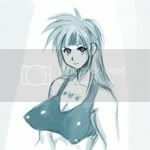 REN does a good job of posting his materials to both his PIXIV and DeviantART page, but B.L-san and Dairoku Tenmaou definitely have stuff that's only available on PIXIV. I hope this guide has been helpful to you. I plan on putting together a similar one for Mixi. If you liked this, you should also check out my guide on Digiket and Webmoney. Please feel free to suggest improvements and to give general comments. Discussion helps me figure out where I can get better, and I simply like to talk about this stuff. Thanks for reading. Here are five random images that you'll probably enjoy. Remember that you'll need to log into PIXIV prior to clicking these links. 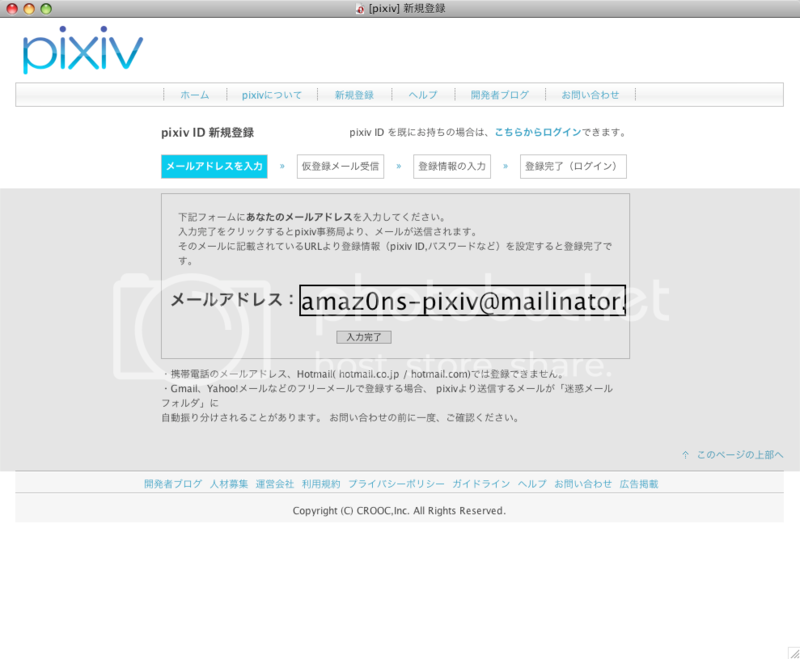 This post is a continuation from PIXIV, which shows people how to get started with PIXIV. If you have some art that you'd like to share with the Japanese Art Community, this second part will show you how to get started with that. I've also got some links to PIXIV searches that will probably be of interest to you. 1. Click the Upload Image Link. 2. Hit the Browse... button and upload your file. Do you have a tag request? Send me a note and I'll try to help you out. Don't forget to check out my PIXIV page and my PIXIV bookmarks while you're there. Some newer works. Remember to sign in if you have an account. If you don't have one, use the account in the first post. Some nice new images at Pixiv. Don't forget to check my Pixiv section regularly for stuff that I don't post here. I've got linked to archived older stuff there as well.